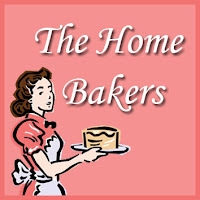 I’m supposed to blog about this bake 2 weeks ago for The Home Bakers… but somehow time just flew by… The Home Bakers is an event organised by Joyce from Kitchen Flavours, in which all of us will bake all the recipes in a chosen book – Coffee Cakes by Lou Seibert Pappas. This time round our host is none other than the organiser herself – Joyce! 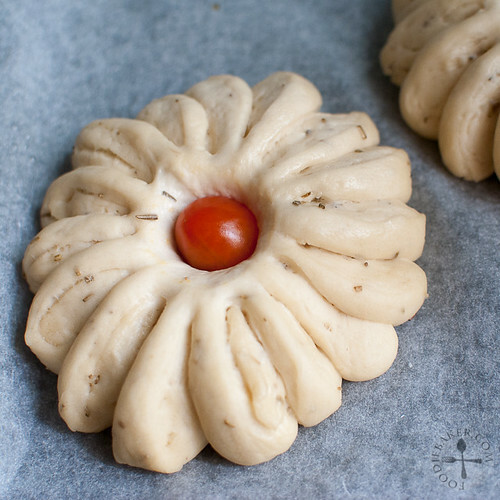 This bake is supposed to be studded with sunflower seeds and olives, but not wanting to buy additional ingredients and not finishing them, I decided to omit them and pressed a cherry tomato in the middle instead. 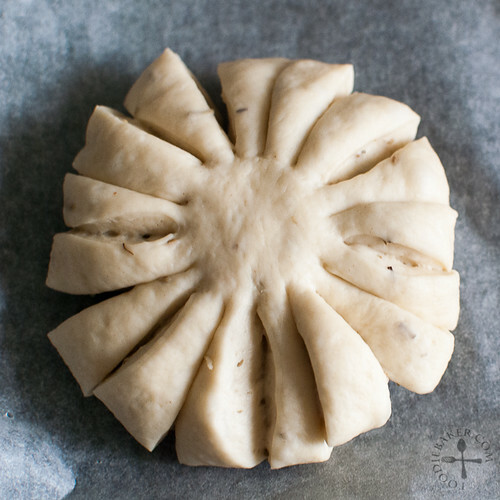 Since I’m not studding them with sunflower seeds, I decided to make mini loaves and shape them into a flower instead, after getting an inspiration from here. I think I might have over-baked the focaccia as my fellow foodies’ loaves aren’t as browned as mine. Texture wise it reminds me of baguette – I don’t think that’s the right texture… but I’ve saved 2 (out of 4) of the loaves and will probably reheat them up when I make some cream soup – think they will go well when dipped in hot, creamy soups! 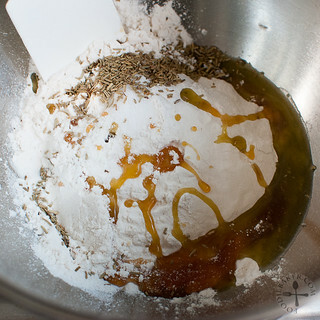 1) Measure all ingredients in a mixing bowl. 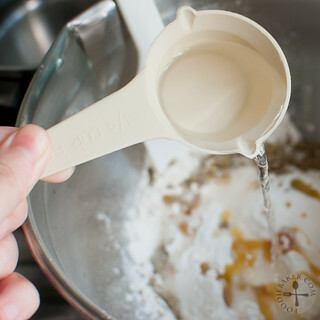 2) add in warm water. 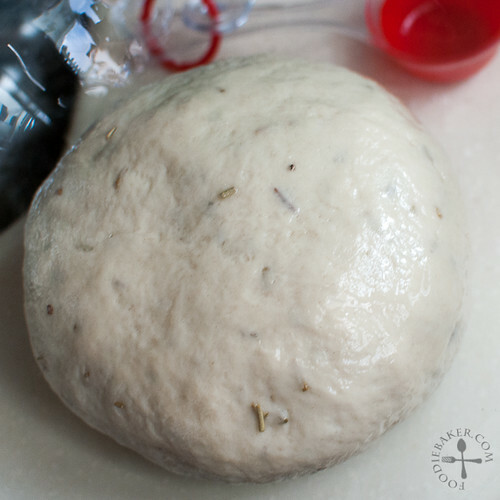 3) Mix to form a loose dough. 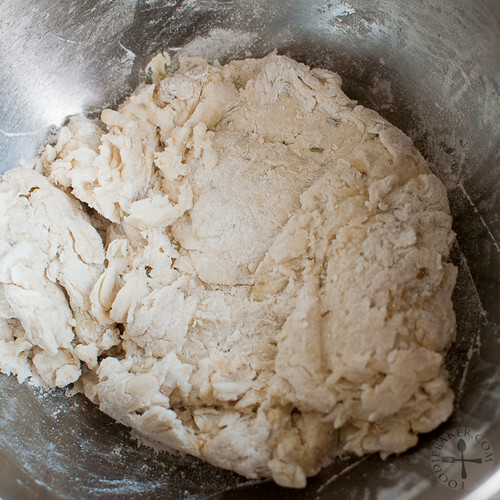 4) Knead until smooth and elastic. 5) Let rise until double in size. 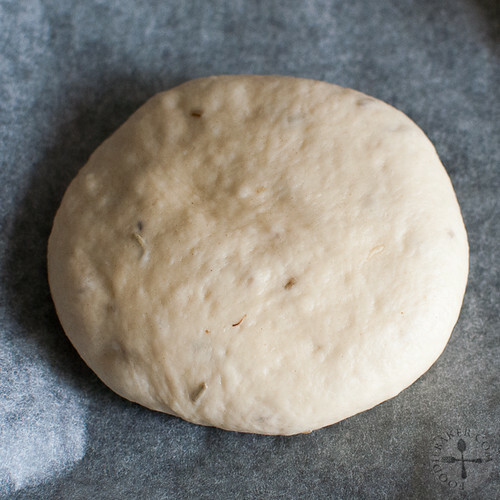 6) Divide the dough and shape into a flat disc. 7) Cut 16 slits. 8) Pull and twist each slit into a flower shape. 9) Rub with olive oil and press a tomato in the middle. 10) Let rise again and bake! This is for The Home Bakers #31 hosted by Joyce of Kitchen Flavours. Do hop over here and see all the submissions! 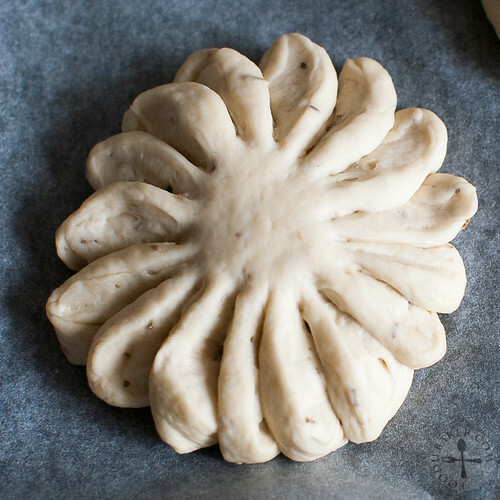 Baking Note: I made 1/2 of the original recipe and divided the dough into 4 small balls and shape each into a flower. You can just make one huge flower if desired. Top with sunflower seeds, pine nuts or almond flakes if desired. For the full instructions, please head over to Joyce’s blog! It’s very cute ! I love this ! 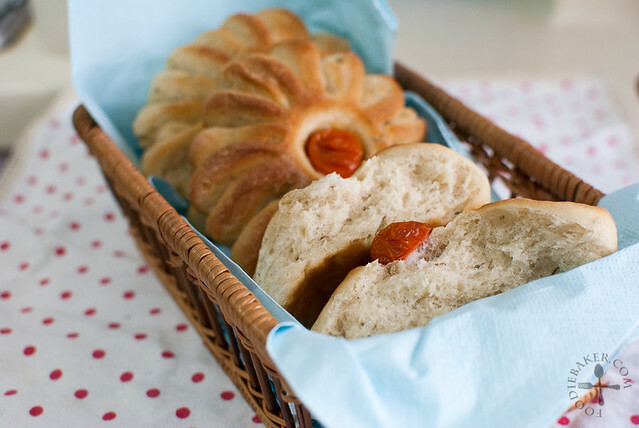 Jasline, I love your focaccia and think the mini breads would be perfect to serve when having company. The baking event sounds very exciting, Jaseline. Rosemary adds such a wonderful flavor! Wow very impressive, that looks perfect chef! 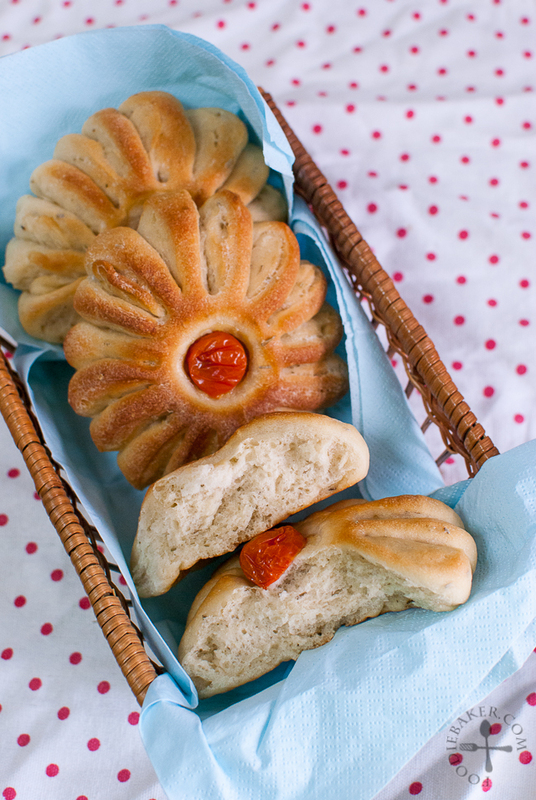 Such cute little focaccia! 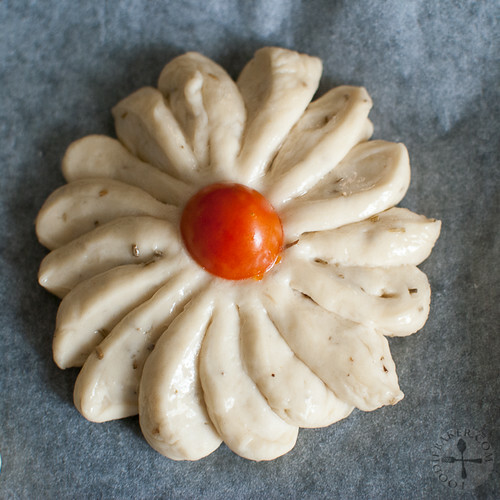 Lovely flowery shape and good idea with the cherry tomato. 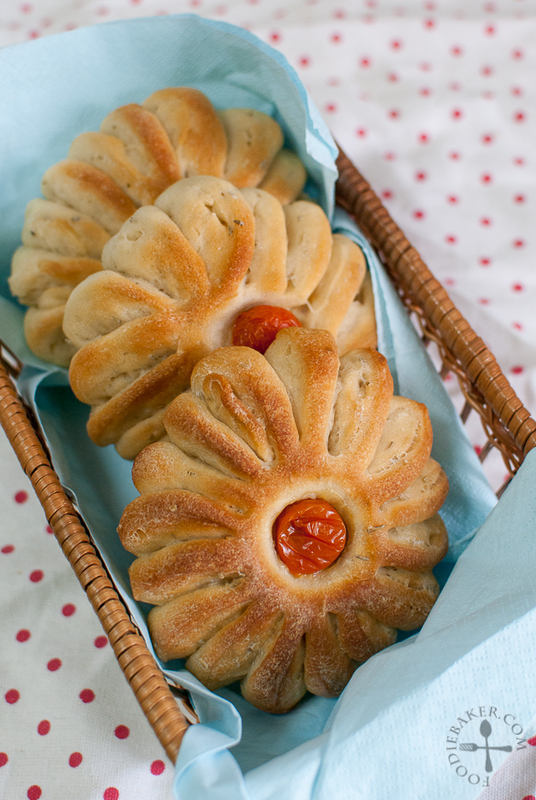 These focaccia is great eaten with hot mushroom soup, which I had for lunch! Pretty! 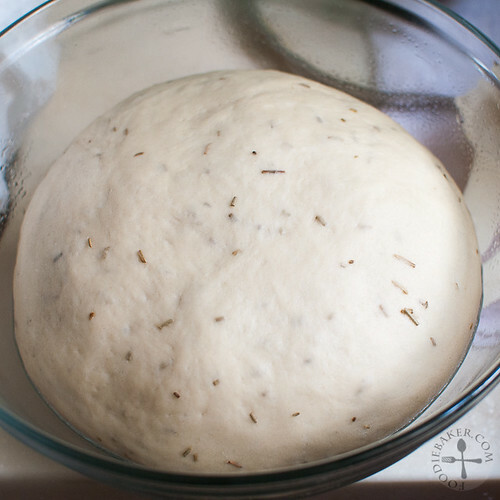 I have seen some other bloggers shaping their dough this way and have always wanted to try it too but somehow whenever I bake some bread, I’ve forgotten lol! Must make a point to remember the next time! What a cute flower shape!